Stay sure of yourself and your every move during work with the relaxed comfort and reliable slip resistance of the Sure Track - Bernal by Skechers® Work. 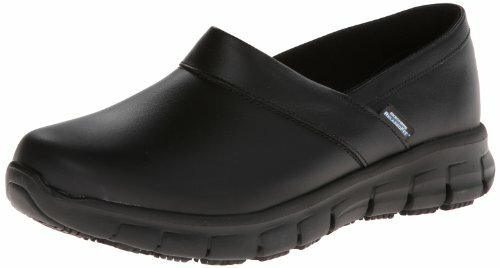 European-style work clog features the Relaxed Fit® design for a roomier, more comfortable fit and Memory Foam cushioning. Smooth leather upper for durability. Side stitching and collar overlay. Soft fabric shoe lining provides added comfort. Removable insole topped with Memory Foam for incredible all-day cushioned comfort. Flexible midsole offers supportive comfort and shock-absorbing protection. OSHA compliant slip-resistant nitrile rubber outsole offers excellent flexibility and traction. Sole is also oil and chemical resistant. Electrical Hazard (EH) safe design rated ASTM F2412-05. Outsole tested ASTM F1677-96 Mark II to meet or exceed a .5 coefficient even on wet and oily surfaces. Imported. Padded instep and heel collar trim. Measurements: Weight: 11 oz Product measurements were taken using size 8.5, width B - Medium. Please note that measurements may vary by size.